The BioTek ELx405RS Plate Washer is a reliable and durable tool with ultrasonic cleaning to keep you up and running. This plate washer is designed with a single manifold to wash, dispense and aspirate 96 well plates. This microplate washer also features vacuum filtration that leaves nothing behind and comes with sample/waste bottles. To make sure the lines are clear, this plate washer has a cavitation feature, an ultrasonic cleaner that rapidly creates and collapses minute vacuum bubbles, creating an agitation that scrubs the inside and outside of the washer eliminating even heavy protein and salt build up. 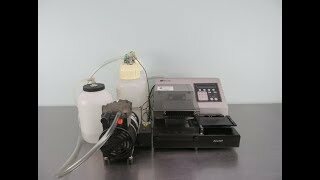 The BioTek ELx405RS Microplate Washer like other BioTek instruments in the family is compatible with the BioStack system making this a great addition to any high-throughput laboratories. This reliable plate washer from BioTek has a built-in over-flow sensor for precision filling of microplates. In addition, the BioTek ELx405 comes equipped with prime, sonicate tubes and cleaning protocols built right into the control pane. This BioTek ELx405RS Pate Washer has been fully inspected and comes with a clean bill of health. All of our lab equipment comes backed with our standard warranty. Should you have any questions, please don't hesitate to contact us.